Gateworks proudly announces the official release of the Ventana GW16083 Ethernet and Fiber-Optic expansion module. The product is shipping now with support on OpenWrt Linux. The expansion module can connect to any of the Ventana SBCs with an optional expansion connector (see website for specific models). The expansion module provides 6 copper GbE Ethernet ports of which two can be steered to SFP cages for Fiber-Optic module support. 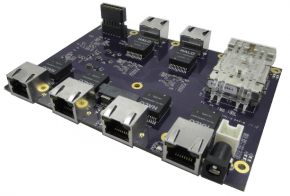 Four of the ports can additionally be configured with an optional PSE PoE module to allow the board to power PoE devices such as IP cameras. Over the last few years, fiber has become more prevalent as the data backbone for many industrial and home installations. In the past, separate equipment was needed to handle the fiber interface, now, with the GW16083 customers can create powerful standalone solutions combining wireless, copper and fiber interfaces into one system.